Travelling in Asia you will likely cross paths with Palm Wine at some point and in my travels I’ve boozed my own fair share; from coconut arrack cocktails in Sri Lanka to Tuba and Lambanog in the Philippines. 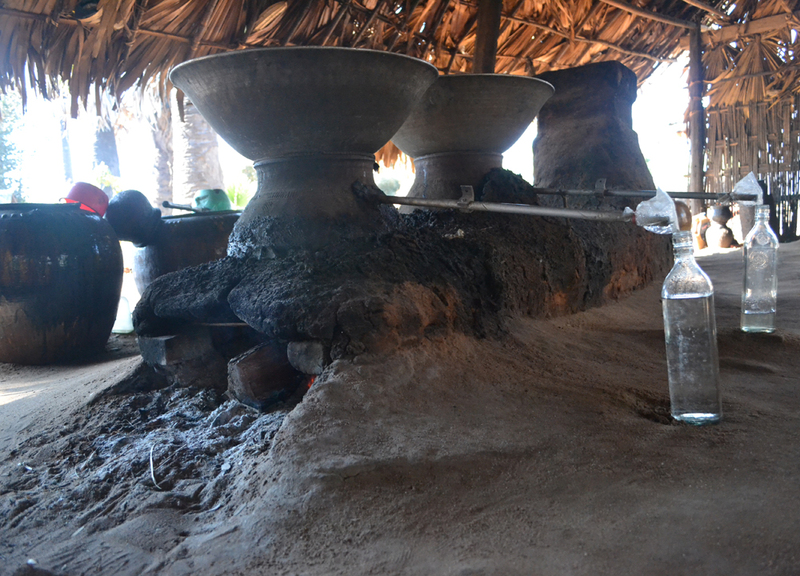 Palm Wine, or Toddy as it is known in Myanmar, is a potent alcohol made from the sap of palm trees and while regionally names and distillation methods do vary the resulting alcohol will almost always be the same. On this journey it is ‘Toddy’ I am sampling at a local palm wine farm and distillery in Myanmar (Burma), found in rural and arid countrysides between Bagan and Mount Popa. I follow the production in process and even throw back a few shots with the locals. Coconut palm trees (below) are scaled using makeshift bamboo ladders (yin) which have been roped tightly to the length of the tree. ‘Tappers’ climb the ladders carrying pots and a clamp-like knife (below left) tied to their waist which are used to ‘tap’ the palm sap (htan) from the young coconut flower clusters at the top of the tree (below right). Incisions are made, cutting the tip of the young coconut flowers and palm sap begins to flow. 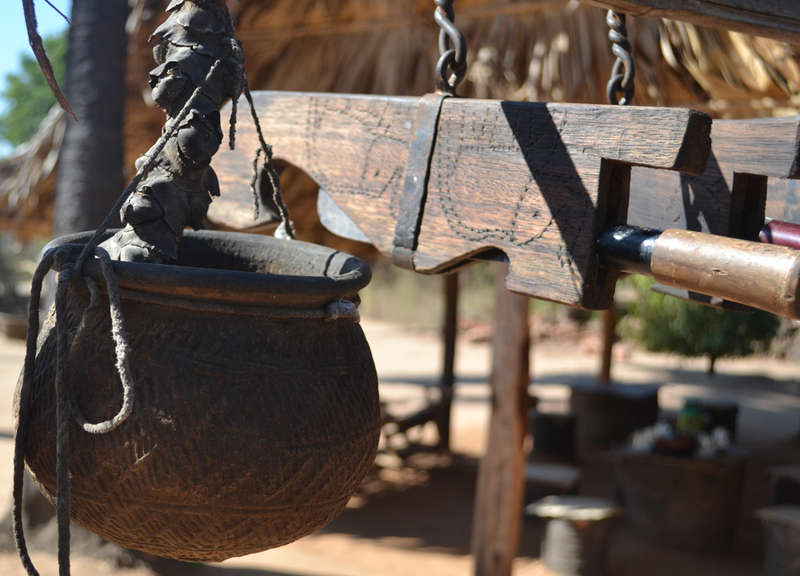 ‘Toddy pots’ are positioned below each incision to collect the flowing palm sap. The tapper then descends the tree returning later when pots have been filled. This process is repeated daily and will often cover 50 plus trees in a farming area. Palm sap after collection is a white liquid, very sweet and non-alcoholic. It is not until fermentation that the palm wine is made. The process of fermentation is in fact very simple as palm sap ferments immediately after collection due to its own natural yeasts (a squeeze of lime helps stop fermentation). The result of fermentation is palm wine a mildly alcoholic drink of around 4% alc. Palm sap left in the sun (heat) takes roughly two hours to create palm wine and, while leaving longer does make stronger alcohol, the taste will be more acidic. Leaving it for longer times will produce vinegar (as used in Filipino food). My real interest however is not in palm wine but the distilled palm wine; an alcohol so potent it challenges the bravest of boozers. At this Myanmar distillery the distillation takes place in fire heated, earthen stills where the more potent toddy alcohol collects in glass bottles spanning at each side. The entire process is surprisingly simple. The end product is a clear spirit with a taste between whisky and rum. The alcohol content is of up to 50%. While often blended or mixed in cocktails, I feel distilled rice wine is best on it’s own. On this occasion, as it was breakfast time and sweet old mum was in tow, I only stay around for 4 or 5 shots before we forward on to Mount Popa. There are a number of local palm farms and distilleries in this area for those interested. While I was there for the booze I do find much more going on. In short the rural palm farms are self-sustainable, they make the most of limited resources which surround them, wood for huts and utensils, leaves for shelter and rope but the more interesting (and commercial) of local products has to be the cow powered mills which squeeze palm sap to create jaggery palm sugars (htanyat). These sugars are then mixed with other ingredients; peanuts, condensed milk and coconut to make a range of sugars and sweets. This will likely come as a post of it’s own. The distilled palm wine can also be mixed with local herbs and leaves to be used for skincare. These palm trees are https://en.m.wikipedia.org/wiki/Arecaceae. I do not think they are called coconut palm tree. They are called palmyra palm or fan palm or toddy palm. And the palm wine is notorious for causing diarrhea among our Myanmar people. May be due to poor hygienic procedure of production. Please beware of diarrhea. Diarrea is caused by bird droppings or bat droppings contaminated toddy (Palm Sap). This is actually Amebiasis and is common in Sri Lanka’s northern palmyrah toddy.